Full spectrum of federal, state, and local environmental laws and regulations and contract, insurance, and indemnity disputes. Calfee’s Environmental litigators aim to achieve our clients’ objectives in litigation and administrative proceedings. Our experience covers the full spectrum of federal, state, and local environmental laws and regulations and contract, insurance, and indemnity disputes. As with any dispute, litigation can be burdensome to the daily operations and bottom line of any organization and can affect all stakeholders. Calfee’s litigators have helped clients manage the burden and obtain successful outcomes. Our Environmental litigators have extensive experience with complex litigation and dispute resolution proceedings under Superfund and in private cost recovery, the Resource Conservation and Recovery Act (RCRA), the Clean Air Act, the Clean Water Act, the National Environmental Policy Act and the Toxic Substances Control Act. We also are well-versed in all related state and common law claims such as nuisance and trespass, citizen suits, and toxic torts. Our clients are engaged in a variety of businesses including metals manufacturing and finishing, waste disposal and wastewater treatment, real estate lending and development, chemical and plastics manufacturing, industrial gases, paints and coatings, and minerals and mining. 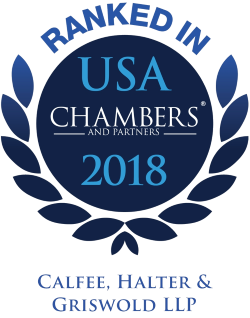 Calfee was selected for inclusion in the 2019 "Best Law Firms" rankings by U.S.News –Best Lawyers in America in Environmental Law several Litigation practice areas. Represented a publicly traded metals manufacturer on contractual recovery of $20 million from its seller to pay for plant site remediation of TCE contamination. Represented a publicly traded industrial gases manufacturer in litigation and administrative proceedings relating to a multi-party Superfund site where on-site incineration was a component of the remedy. Represented a Fortune 500 chemical and plastics manufacturer in litigation and administrative proceedings relating to a multi-party Superfund site involving claims of surface water, stream sediment and wetlands contamination. Represented a subsidiary of a Fortune 200 chemical manufacturer in administrative and contempt proceedings brought by the State of Ohio relating to a RCRA closure and groundwater remediation. Represent a wholly-owned subsidiary of a global chemical company in its participation in the precedent-setting Great Lakes Legacy Act $82 million cleanup (alternative to Superfund) of the Ashtabula River. Represent a publicly traded ferrous metals foundry in defense of claims brought by two paper companies relating contribution for the $1.5 billion cleanup of PCB contamination in the Lower Fox River System in Wisconsin. Represented a State of Ohio department in its claims against a fuel tank farm owner and operator relating to one of the largest gasoline spills in Ohio history and its contamination of the neighboring Maumee River Crossing (interstate highway) construction project. Represented a former paper manufacturer in defense of a CERCLA private cost recovery, RCRA citizen suit and state statutory contract common law claims relating to the alleged multi-million-dollar PCB cleanup of former paper mill facilities. Represent a Fortune 1000 paint, coatings and related products holding company with respect to the nationwide management of its operating subsidiaries’ off-site and legacy environmental liabilities. Represented a large Ohio municipality in defense of Clean Water Act SSO/CSO claims brought by Ohio and the United States resulting in a Consent Decree resolving thousands of days of violations with a $60,000 civil penalty and an extended construction schedule patterned after the city’s long-term control plan. We also serve the State of Ohio, Ohio municipalities, and other government entities.